Mortgage Rates May 2017. NSH Mortgage has the wisdom and tools to help you with understanding how to stay on top of your mortgage rates in May 2017. May could be a roller-coaster for mortgage rates. The euro-zone expects the French election to affect the mortgage rates, and here at home the Federal Reserve meets for the third time this year to discuss these issues. And markets try to water witch the economy amidst Donald Trump’s proposals. Thus far into 2017, mortgage rates have been flat to lower. Freddie Mac reported an average rates near four percent during the last week of April. Home buyers and refinancing homeowners are pleasantly surprised, though, after analysts called for rates in the mid-4s by now. Today’s mortgage rates are about $35 per month cheaper than they were at the start of the year on a $350,000 mortgage. But will rates hold? May could be their turning point in 2017. The average conventional 30 year fixed rate mortgage started May at 4.03%, according to Freddie Mac’s Primary Mortgage Market Survey (PMMS). That is down 11 basis points (0.11%) compared to the first week of April. The 15 year clocked in at 3.27%, and the five year adjustable rate mortgage (ARM) dropped to 3.12%. 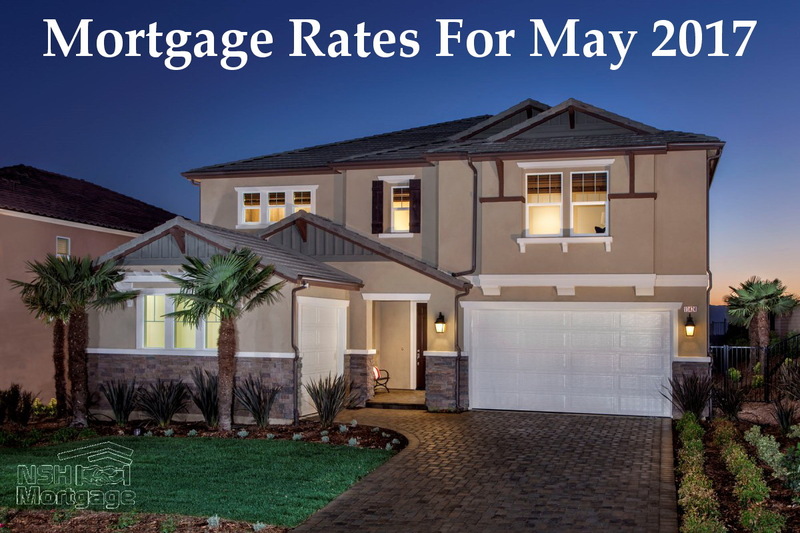 Rates are down considerably since January, when the 30 year rate hit 4.20%. It is an advantageous time to be a mortgage rate shopper because we are now locked in a downward drift. That is making shopping for rates easier. In a steady to lower market, your rate is more likely to be there in a day or two when you are ready to move forward. Rising rates, though, can price you out of the home you really want. And, a slightly higher rate can take the value out of a refinance. That is why it is wise to request a rate lock when you see a rate you like. In any environment, though, you want to take Freddie Mac’s average rate with a grain of salt meaning, do not assume that will be your rate. Freddie Mac publishes rates for the mythical perfect applicant: one with high credit scores and a big down payment, using a conventional loan. But some applicants have tarnished credit and some will not consider conventional financing at all. The surprising thing is, those applicants might qualify for lower rates than conventional borrowers. FHA loans, for instance, come with lower rates, according to loan software company Ellie Mae. In March, the average FHA loan recipient got a rate of 4.32% while the typical conventional borrower received 4.50%. VA loans offer the best rates, at just 4.10% in March. Ironically, FHA and VA loans are fashioned for lower credit borrowers, but offer lower rates. They are meant to get renters into their own homes especially those who would not otherwise qualify. Been turned down? Forget about conventional financing. Go for FHA, VA, or the up and coming USDA loan. Today’s mortgage rates are hovering in the low fours, and many mortgage rates predictions have them unchanged to higher through 2017. Loans now cost just $480 monthly for every $100,000 borrowed, excluding escrows for taxes and insurance, private mortgage insurance (PMI), and flood insurance, where applicable. It should be noted, though, that although mortgage rates are still historically low, they may not stay that way for long. Mortgage rates change quickly with the economy, and with shifts in market sentiment. Mortgage backed securities (MBS) the Wall Street asset on which mortgage rates are made have been waiting for a reason to move one way or another. This has rates on shaky ground. MBS pricing is responding to influences on the economy, including the Federal Reserve’s monetary policy, the jobs market, and forecasts for the new administration’s stance on economic issues. The biggest market mover this month, though, might begin far off U.S. shores. On May 7, France votes in its next president. Preliminary polls closed at the end of April. Eleven candidates were whittled down to two: European Union (EU) fan Emmanuel Macron and anti-EU candidate Marine Le Pen. In short, a Macron presidency would be viewed as the status quo and would leave mortgage rates little changed. He would not fight to leave the EU, making the euro-zone’s economy more predictable. Le Pen, on the other hand, is considered the Donald Trump of France. She would push to leave the EU and even the euro, sending shock waves through the region’s economy. That could help mortgage rates, much like Brexit did last summer. Investors flee to mortgage bonds in shaky economic times, which drives down rates. Macron is the clear leader in the race. But that sets up an opportunity for rates to fall. If Le Pen wins, be prepared to lock on Monday, May eighth when markets open. Rates could drop precipitously in the aftermath, and mortgage shoppers should be ready. Trump wants to put a lid on high taxes. What is not clear, though, is whether the administration can move changes through Congress. Trump outlined his tax plan April 26. A feasible bill could bump up mortgage rates. When inflation shoots higher, rates on mortgages must follow them up. Investors will not buy a mortgage bond that pays 3.5% annually if inflation is 4%. That is losing money. Recently, a failed healthcare bill pulled down mortgage rates substantially. It was taken as a harbinger of future plans. If that bill cannot make it through, how will others fare? But the Trump tax plan is no harbinger. It is the main event, tax relief would directly affect economic activity. But, a bill has not been proposed, and no one knows if one will be introduced in May. A failed bill, though, could usher in lower rates this month. But, a bill has not been proposed, and no one knows if one will be introduced in May. A failed bill, though, could usher in lower rates this month. The Federal Reserve will meet two more times by the midpoint of 2017. Each meeting contains a chance of another rate hike. But do not expect a move during the May’s second to the third meetings. Currently, there is only a 3% chance of that. One point of interest, though, is that the chance of a June rate hike is near 70%. Mortgage rate shoppers should be watching for what the Fed says in its post-meeting announcement. Rumblings about its holdings of mortgage backed securities (MBS) could move markets. It currently owns more MBS than all commercial banks combined. Dumping MBS would cause mortgage rates to rise. Supply would increase, driving down relative demand. Expect rates to rise if the Fed lays out plans to sell MBS in the foreseeable future. MBS policy is often less predictable than the movement of the Federal Funds Rate. By the time the Fed meets, Fed Funds Rate hike (or lack thereof) is all but a foregone conclusion. That was because members of the Federal Reserve forcefully hint about the hike in various speeches leading up to the meeting. This is meant to help investors gradually digest the Fed’s intentions. This strategy waylays huge market swings that would accompany an unexpected move. For May, no such hints have come out. For the June meeting, it will pay know when members of the Fed are speaking. The following is a list of those engagements in May that might offer further confirmation of a future rate hike. Often, mortgage rates will bounce either higher or lower based on Fed rhetoric. It could be wise to lock in a rate before this string of speeches. Mortgage programs today come with low rates in the fours. Still, some mortgage programs are cheaper than others. Ellie Mae, a mortgage software firm which processes 3.7 million applications per year, gathers data on loans run through its system monthly. Its March Origination Insight Report was telling. Government backed programs, falsely perceived to have worse terms, actually carried the best mortgage rates. The following average rates were reported by Ellie Mae. As stated previously, these rates differ from Freddie Mac’s average rates due to varying types of borrowers and the properties they purchase. Plus, there are many types of loans, all offering their own interest rates. Each loan type has its place in the market. Fannie Mae and Freddie Mac purveyors of conventional loans have rolled out new programs for a wider array of buyers. A newer option donned HomeReady™ requires just 3% down and is available to those with modest incomes. Additionally, Fannie Mae has just introduced easier qualification standards for mortgage applicants with student loans. Often, the lender will reduce or completely eliminate the student loan payment from debt to income calculations. Also, a Student Loan Cash Out program is now in effect, with which homeowners can use their home equity to pay off student loans. Not to be outdone, the government backed VA home loan offers a home buying as well as a refinance cash out option. Both options come with lenient credit requirements and are available to home buyers who have served in the U.S. military. There is no down payment necessary, and no monthly mortgage insurance charged. FHA loans are extremely popular, used by about 40% of first-time home buyers in their 20s and 30s. Flexible lending requirements allow new graduates to obtain an approval just after starting their careers. A loan program not covered by Ellie Mae’s report is the USDA home loan, otherwise known as the Rural Development (RD) Guaranteed Housing Loan or Section 502 loan. It supports home-ownership in less dense areas in which incomes often lag those within cities. There is no down payment required, and minimum credit scores are low. USDA mortgage rates are about as low as VA ones, making them one of the most affordable home buying options on the market. For rural and suburban home buyers, there are few better options than the USDA loan. Mortgage rates for these programs are still low, and could go lower in 2017. The next four weeks hold no shortage of market moving news. Notably, watch for the developments in the French Election and the Federal Reserve meeting. May could be a volatile month for mortgage rates. Lock in now if you are comfortable with your quoted rate.